You find me in a rather confused state this evening. The calendars all say it's Spring, the Daffodils are out and we even have the first Spring migrants landing on our shores, so why on earth did I have my face almost frozen off during a short walk on Saturday? More to the point why is the evening news full of eight foot snowdrifts and huge power outages? We seem to have missed the worst of it here in South Wales (with the exception of freezing temperatures) but even so this ranks as a fairly unusual March. Fortunately I've found myself otherwise engaged for much of the month so haven't been too disappointed with conditions (doing DIY does sometimes have its advantages) but now I'm raring to go again and am finding that the warm and pleasant weather of last Easter is but a distant memory. Boy am I glad that we chose not to go camping next weekend as planned! Having an assortment of tools in hand has limited the number of outings that I've undertaken recently with just my local patch getting any real attention. As it turned out this has been pretty productive with the highlight being my first two Wheatears of the year on Saturday. They were both males in pristine condition and, though timid, did allow me to get good views as they fed in the only part of the valley that wasn't being blasted by an ice cold easterly. Through my watering eyes it was only the briefest glimpse of a disappearing white rump that had alerted me to their presence and those few seconds easily rank as my March birding highlight. Of course as every birder knows your first Wheatear of the year has to be photographed and shared, no matter its inevitable lack of quality. This is my contribution. While watching the Wheatears a fortuitous glance skywards saw me setting eyes on a flock of waders flying some distance away. On my patch these are like gold dust with the wader all-time list currently consisting of just a pair of Lapwing and one Snipe. These birds were clearly something different however and despite the gloom I am confident that they were Golden Plover. 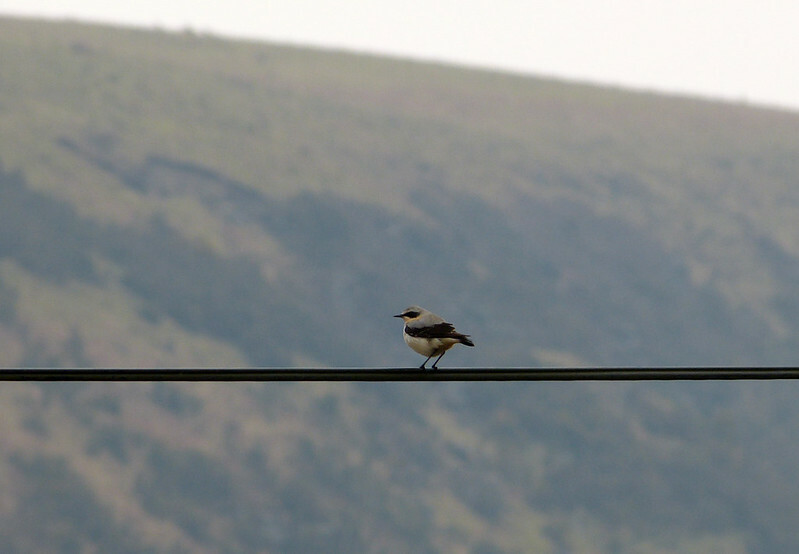 There were at least thirty birds in the group and it would be remiss of me not to include a poor photo of them to keep the Wheatear above company. There have also been a couple of other notable 2013 ticks recently including the long awaited reappearance of my Yellowhammers. Admittedly I didn't actually see them but the sound of two calling birds below Gopa Hill were unmistakeable and almost made me forget the loss of feeling in my toes. Another vocal visitor came in the shape of several overflying Canada Geese, heard from the back garden but again sadly not seen. That was certainly not a problem for the Grey Heron I spotted at the start of the month, presumably on one of its routes between garden ponds. All the regulars are still around including a record eight Greenfinch on the feeder last weekend, an ever increasing number of House Sparrows and the now familiar male Pied Wagtail. Buzzards and Ravens have been flying over the garden on an almost daily basis and it's been a delight to watch the Red Kites soaring through the valleys. The one above was taken on our last clear evening and was catching the late evening rays beautifully. Let's hope that blue sky returns soon. It has been bitterly cold here, too. 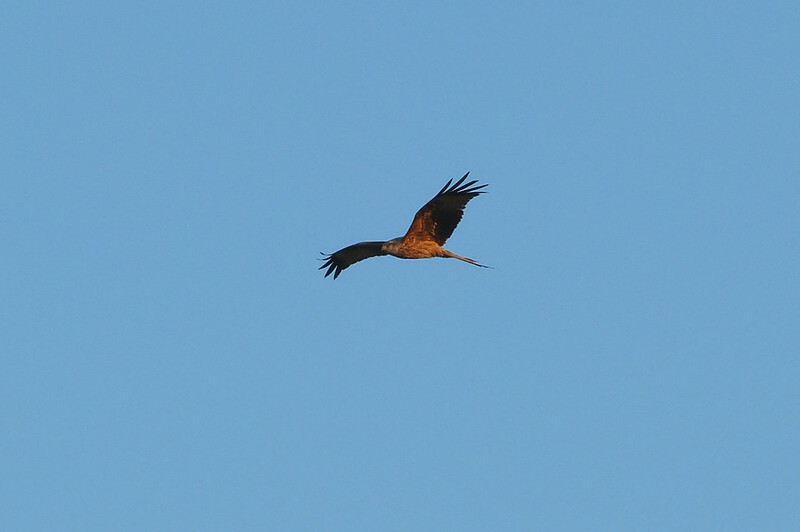 However, I saw our first Red Kites of 2013 over the Easter w/e.